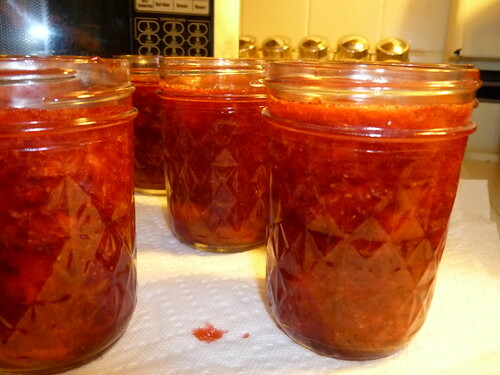 We made strawberry jam this morning. That’s “we” as in myself and the two smaller grandchildren, who are four and six. I had enough strawberries to make a lot of jam, so I thought I would invite the small fry to help with the freezer jam batch – fewer opportunities for mishaps with hot things like boiling jam. They helped crush berries (after they scrubbed their hands twice with soap and a brush), took turns pouring sugar, stirred things, juiced lemons and even got to pour jam into the jars. Aside from the usual mayhem of small children in a cooking project it went well. There were the usual top-of-the-voice utterances: “Nana, she ate another strawberry!” “Oooh, this looks like blood!” “It’s all squishy!” and the oft-repeated “Uh-oh!” We talked about the hows and whys of jam making, such as what pectin is and why you need to add lemon juice. While we were at it there were several opportunities to discuss other issues, like when should you be a tattletale (hint: not when your sister sneaks a strawberry). Then we washed up – the four-year-old had strawberry juice clear to her armpits – and they got to take four jars of the finished product home to Mom and Dad. There was a time when parents and grandparents were the primary people educating their children, and much of that education happened while something else was being accomplished. You made jam and taught them to distinguish between the Goody-Two-Shoes gloating kind of tale-bearing and the really important stuff that should be told, like Zachary being a bully or Melinda going to jump off the barn roof in her home-made bird wings. You weeded the garden and discussed how to save seeds and how to tell when the corn was ripe. You folded clothes and had a conversation about whether you should forgive if a friend tells you a lie, or find a new friend. Values and the skills of basic living were demonstrated and absorbed on a daily basis. My grandchildren are extremely fortunate that their parents make their living from the ranch. That means both of them are here pretty much all the time, as are we. Nobody rushes off to the office or stays late on a project instead of being around the ranch. The kids get to participate in everything from supervising the sow when she farrows, to painting and naming the chicken tractor (The Terminegger won out) to holding tools for their grandfather while he repairs equipment. They get to see first-hand how the family adults settle disagreements (sometimes with reasoned discussion and sometimes with a shouting match – I never said we were perfect!). They get their hands dirty (along with the rest of their anatomy), learn when not to yell at the sheep, watch wild turkeys trotting through the pastures and find out what bear poop looks like. It’s hard to beat growing up on a ranch for a diversified education. Public schools could learn a lot from this system. And now, I guess I’d better go clean the strawberry juice off the ceiling. This entry was posted in Farms, Food. Bookmark the permalink.